The walk starts quite gently going through ancient woodland, and then opens out to some lovely scenery. It’s a pleasant start following the track that used to lead to the quarry. Along the way we passed the Gladstone Rock and then came to the ruins of the mine buildings - the old barracks for the South Snowdon Slate Quarry. The valley was used as the location for the film 'Carry on up the Khyber', and there's more history here as on the walls or the old quarry manager's house are pock marks bearing evidence to the WW1 troops target practice during training. 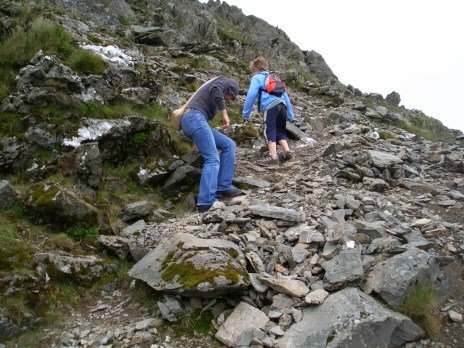 The top of the Watkin Path is over scree which must be treated with the utmost respect. It’s steep, and slippery, and loose underfoot. The rest of the Watkin Path is fairly well marked, but it's easy to loose sight of the way over the scree - there are some dangerous crags and cliffs so proceed with extreme caution. Children, in particular should be carefully watched.Something that I can attest to is that in poor weather the scree is very dangerous. If you are attempting to climb the Watkin Path I would really advise that you avoid a misty day, or a day when there is snow on the summit unless are experienced. Of course, when we set out it was a lovely sunny day without a cloud in the sky, so it's not always easy to avoid. If it gets very windy or foggy as you approach the scree, do consider whether it might be best to turn back and make another attempt another day. You'll probably find you won't be alone in this decision.